"A ready and generous response" was indeed made to Dr. Morgan's appeal and the church was rebuilt during the years, 1839-41. The Most Rev. Dr. Blake, Bishop of Dromore, officiated at the dedication on July 25th. 1841, in the presence of a vast concourse of people from all parts of Ulster. The sermon on the occasion was preached by the celebrated Father Mathew, the "Apostle of Temperance", who gave Dr. Morgan a gift of 50 pounds towards the cost of the building. 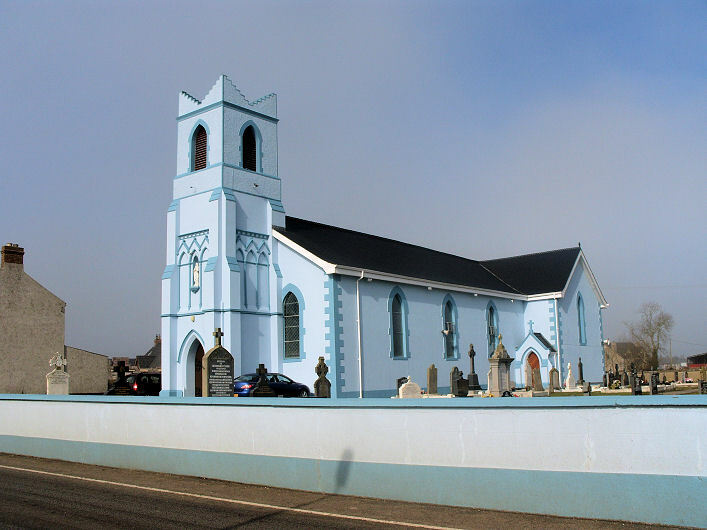 Before and after the ceremony, Father Mathew administered the pledge to thousands of people, as recorded in a long report in the Newry Examiner of July 28th, 1841. Our thanks to Frank. McCrory for some of the information used.